EXECUTIVE SUMMARY: A new strategic symbiosis has evolved over the past decade between Hezbollah and the Lebanese state, enabling the Islamist group to pursue its massive military buildup with impunity. This necessitates that Israel revisit its strategic doctrine vis-à-vis Lebanon and clarify to the Lebanese government the devastating consequences that could result from a new Hezbollah-induced war with Israel. The question of Lebanon’s responsibility for acts of aggression emanating from its territory has long preoccupied Israeli decision-makers. During the Second Lebanon War, for instance, Prime Minister Olmert rejected the demand by Chief-of-Staff Halutz to attack Lebanese national infrastructures in response to Hezbollah’s sustained missile attacks on Israel’s population centers. UN Security Council Resolution 1701 of August 11, 2006, which ended the war, reflected the international hope that the Lebanese government would reassert its authority throughout the country, including the disarmament of all Lebanese armed groups and the prevention of any armed groups, apart from the Lebanese army and the UN’s force in Lebanon (UNIFIL), from operating in southern Lebanon. Nothing of the sort happened. Not only was Hezbollah not disarmed as envisaged by the UN resolution, but it has substantially expanded its military capabilities, both quantitatively and qualitatively, and has done so with the tacit support of the Lebanese army and government. So much so that it is arguable that over the past decade, a new strategic symbiosis has evolved between the Islamist group and the institutional state of Lebanon, with a useful division of labor in numerous fields. 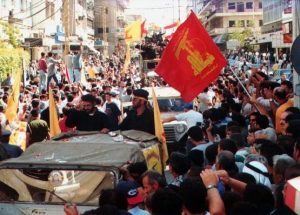 Thus, for example, Lebanese army soldiers, as the official state representatives, are responsible for security checks and the general protection of the Dahiya district in Beirut, home to Hezbollah headquarters; whereas the Islamist group’s fighting in Syria has served Lebanese interests (apart from those of Iran, Hezbollah’s founding patron). A high level of operational collaboration between Hezbollah and the Lebanese army was manifested in their joint fight against ISIS forces in the Qalamoun Mountains on the Syrian-Lebanese border. No less important, Hezbollah has been the moving spirit behind the Lebanese army’s adamant objection, voiced in its monthly meetings with the IDF under the UNIFIL’s auspices, to the erection of a security fence on the Israeli side of the border. In these circumstances, it is impossible to preclude the possibility that in a future war between Israel and Hezbollah, the Lebanese army may play an active role in helping the Islamist group to rebuff IDF operations deep in Lebanon. This is at a time when this army has been the recipient of US arms and military training over the past few years. By skillfully exploiting this hybrid reality, Lebanon has successfully conducted itself between two opposing poles: close economic and military cooperation with the Western nations (France and the US in particular) on the one hand, and tight association with Syria and Iran (via Hezbollah) on the other. This delicate balancing act helps explain both Lebanon’s success in weathering the turbulence that has rocked the Arab world since 2011 and its ability to evade international censure for its symbiotic relationship with Hezbollah. Given this symbiosis, and the unprecedented scope of Hezbollah’s offensive and defensive deployment throughout Lebanon, Israel needs to rethink its strategic doctrine vis-à-vis Lebanon without delay. PM Netanyahu’s warning that Lebanon would be held accountable for any acts of aggression emanating from its sovereign territory is a necessary, but by no means sufficient, step in the right direction. What is required is a sustained Israeli-led international effort to clarify to the Lebanese government (and Hezbollah) in no uncertain terms the devastating consequences to the Lebanese state of a new Hezbollah-induced war with Israel. An earlier version of this article was published in Hebrew in Israel Hayom on December 7.